Far be it from me to pass up the opportunity to attend a free clinic of any sort. When the opportunity presented itself this past Saturday, I made sure I had a front-row seat for Curt Pate's Horsemanship presentation. 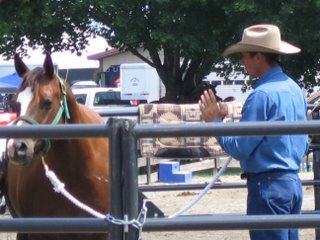 Pate's presence at the AQHA Region 5 Experience was an unexpected delight. Not that the entire show wasn't worth the visit, but who wouldn't love the chance to watch one of the two trainer-consultants who made The Horse Whisperer come to life on the big screen without some of the more questionable guff that appeared in the print version? The focus of the clinic was the saddling of a heretofore un-saddle-broke young mare. I don't recall that Pate mentioned the filly's age, but I would guess her to have been around three. There was a recurrent theme to Pate's presentation, both verbal and non-verbal, and that was "in your own time". His quiet manner and calm approach were striking from the moment he entered the round pen. The filly responded accordingly. It was obvious that she'd had considerable handling, so there were moments of "do as I say, not as I do" while the man demonstrated the use of the soft lead rope and the calf rope to sack out the horse. But in that context there were also moments when the mare found herself facing something brand new, and she was able to get through the experience pretty much stress-free thanks to the traner's patient and calm approach. Each experience took however long it took. No timelines here, thanks. I won't belabor the details of the saddle-breaking. The whole thing went off without a hitch, though the mare didn't like the saddle and she was annoyed by the feel of the pad on her back. A little kicking and some ear-language made her displeasure clear, but Pate gave her time to think about the situation, and in the end all was well. There were some truly distinctive take-homes that I do want to share. There is nothing natural about natural horsemanship. That was an eye-opener, for sure, but he made perfect sense. Nothing we do with horses has anything to do with what horses would do if we just left them alone. 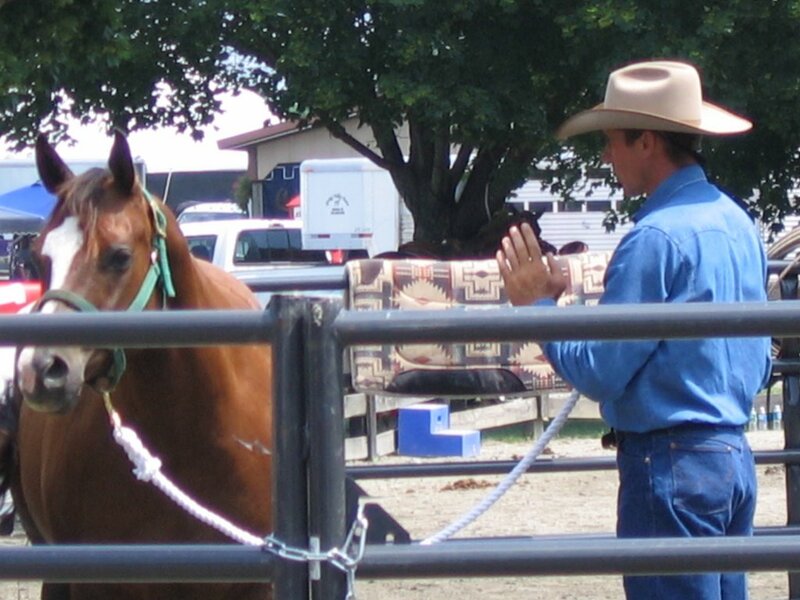 Horse shows are a source of great stress, both in the training leading up to them and the performance. Pate singled out reining as a major offender in this area, but it was easy to see how the other disciplines share the blame. 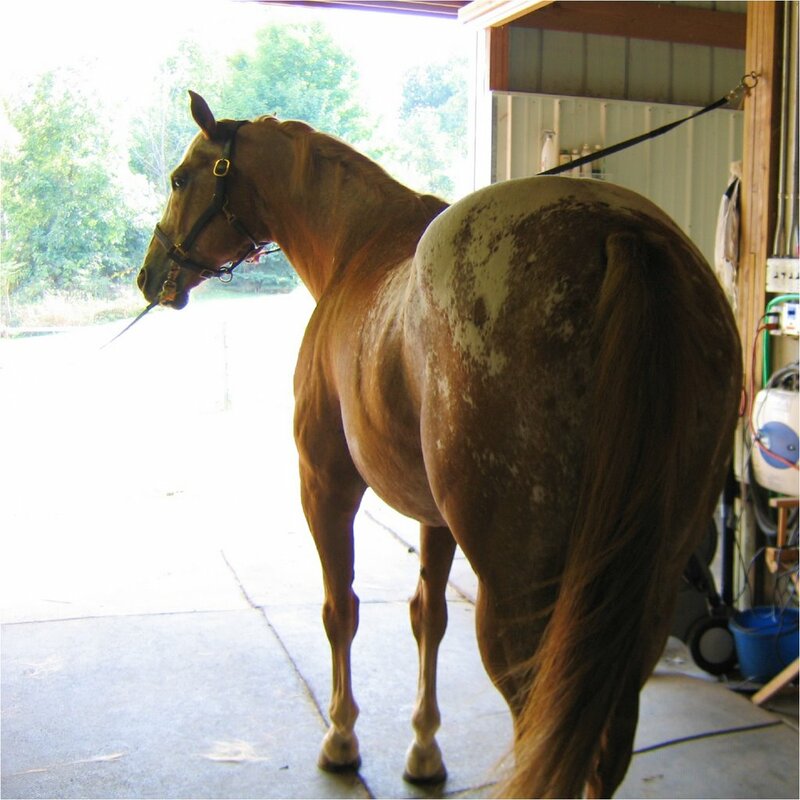 Stress is a big component in our horses' lack of overall good health. He is working with Farnum to help improve horse management and to study how stress reduces the efficacy of drugs and vaccines. Food for thought, there! 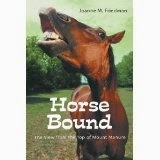 If we insist on tormenting (his word) our horses, we need to give them equal time to be horses. "Tormenting" includes forcing a horse onto the bit, too much use of leg, too much being taught at one time, bending a horse so much that it can't move naturally, and so on. A horse can only think about one thing at a time. This one is huge! If we're "asking for bend" with leg, hand, seat and balance, the horse is only attending to one of those cues. He's probably upset and confused most of the time, even though we, in our arrogance, choose to believe he's a happy camper as long as he's not bucking us off. Amateurs should not break colts. Period. More damage is done psychologically and physically by amateurs who think they know how to accomplish this task than by any other cause. Round-penning doesn't work; it just causes unnecessary stress. Whoa! I need to chew on that one a while. There was much, much more. At one point Pate pointed out that he would probably not be invited to attend any other AQHA Regional Experiences thanks to his candor about showing and training. I hope that's not the case. 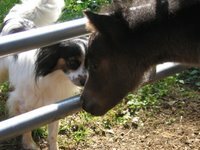 I would hope that a breed association of which I've been a member for about twenty years would be more attuned to the good of the horse than to the bottom line of the breeder. 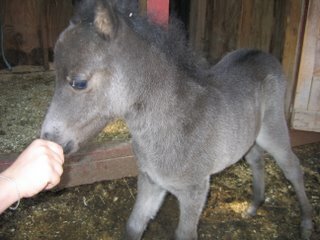 In sum, I can't stress enough how important it is to keep an open mind and never stop learning the art of horsemanship. Curt Pate began his lecture by announcing that he's completely changed his approach in the past two years. That's where the Down With Round-Penning part came in. He has his reasons, and they're well based in experience . . . far more experience than you or I will ever have. This has been a hellish weather year here in East Overcoat, New Jersey. It hasn't been dreadful. We weren't ice-skating on the hay field in January (thank GOD--last time we did that I was laid up for three months), nor has the Christmas tree patch turned into Lake Friedman with the Ickypoo River running in dirty rivulets through my neighbor's basement. What's made it so awful is that is has been unpredictable. I don't care how many meteorologists they hire at Weather Central, they still can't tell me whether or not it's worth grooming and tacking up on any given day at any particular time. Take now, for instance. It's Friday, July 21st. This morning I awoke to a big green splotch with flame-red patches creeping across my part of the TV weather map. 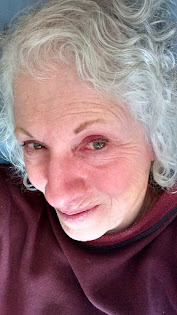 I forewent the usual combing and makeup ritual, tossed on yesterday's barn clothes, and ran out to get the horses fed and in their stalls. And none too soon it was! Before I was back in the house some fifteen minutes later, the sky had opened and ligtning was ripping the sky in the direction of the next town north of here, headed my way with criminal intent. An hour later the power was out. I, believing the map, thought this was to have been a short-lived storm, so I was still in flagrante disgusto. Wells don't like power outages. They get irritable and hoard their water so you can't flush or bathe or do any of the other ritualistic things we take for granted. The fans in the barn were silent. The telephone made odd chirping noises. I read two newspapers. Talk about icky! Another hour went by, and the power was back. I waited a bit till the sky turned blue, then hustled the equines out to the pasture and readied their stalls for Round 2, promised for later. The pondering began. I changed twice. Stripped and ran the water in the shower once. Watched the weather four times. Answered some emails. Heated up lunch while stripping, running the shower, and watching the weather. Finally decided it was safe to put on breeches and grab the horse most in need and least in desire of riding. Do I need to tell you that the clouds are rolling in and I can here, through the still-unwashed hair covering my ears, the gentle roll of thunder in the distance? There's no storm on the map. I shook the TV and cursed at the weatherman. How can we have a storm with no green-and-red on the map? In a few minutes I'll change my clothes again. I can guarantee that the sun will be shining brightly by the time I'm out of the shower. I know this like I know that we won't ever have a blizzard like the blizzard of '95 again because I now own the biggest honkin' track-drive snow-blower ever made. I know this like I know that the power will never again go out for four days in a row because I put $4000 into a generator and appropriate wiring to keep my little chunk of heaven operational when it does. I know this because I'm looking out the window, and the sun is lighting the pasture, reflecting happy beams from the ankle-deep pond left by this morning's torrential downpour. I'm going to go now. I'll throw on riding clothes, and--damn it!--I'm going to ride something, even if it's the tractor. I'll pick the horse that fits the synthetic saddle so I won't ruin my good tack (again). I'll ride in circles in the ring for twenty minutes like I did yesterday when the high for the day surpassed the prediction by 15 degrees leaving Zip and me sweating and glaring at each other. Want to put money on how many minutes will pass before the next storm? I'm open to a little gamble about now. It never occurred to me that my stud siring a baby would be an emotional experience for me, especially since the mare isn't mine, and I didn't go through the pregnancy and birth with her. I've done that, and that is emotional! This, by comparison, was distant and removed. 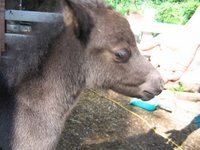 I didn't know the mare was pregnant until the owner emailed me to tell me the foal had been born. Even then, it didn't impinge on my sphere of unreality until I paid a visit to the new baby. I couldn't stop taking pictures. This little girl is the cutest thing on four legs, bar none. Look for yourself. If you have a different opinion, keep it to yourself. But that wasn't the point I intended to make. The point is that there is something in the inner human that is seriously touched by something in the inner horse. I'm sure Duke has no idea why he got extra cookies this weekend, nor would he care. He would probably be protective of his baby and her mother. That's standard Horse Stuff 101. But my own personal investment in this is nil. I'm totally sucked in by the big-eyed-baby cuteness factor and my maternal instincts just slammed open the door and screamed "We're BACK!" How much of the rest of our attraction to horses is bedded down in the depths of our humanity somewhere between the survival instinct and the craving for designer shoes? We make noises like we know what we're doing when we just have to have that new gelding because show season is just around the corner, and Tigger's Pesto is a bit under-impulsed, and blah-de-blah. But what's the truth of the matter? Is it simple human aquisitive behavior? Or is it that we see in a horse a reflection of something in ourselves that we're trying hard (and not always successfully) to hold onto? Beats me. I'm just delighted that there's a new girl in town and she's cute as a bug and somehow related to me. Go figure.